Sisters Underground was a New Zealand hip hop and R&B duo, best known for their 1994 single "In the Neighbourhood". Group members Brenda Makammeoafi and Hassanah Iroegbu originally met aged 13, at Hillary College in Otara, South Auckland. Iroegbu was an immigrant from the USA, of Nigerian, Arab and German heritage. By 1990 the pair were performing around Auckland as Sisters Underground. They were put in touch with music producer Alan Jansson, who recorded two tracks ("In The Neighbourhood" and "Ain't It True" with them for the upcoming compilation album Proud. "In The Neighbourhood" was released as a single, along with a music video by Greg Semu. The song peaked at #6 in the New Zealand singles chart, and charted for 12 weeks. In Australia, "In the Neighbourhood" peaked at #62 on the ARIA singles chart, and spent 10 weeks in the top 100. In 1995 the duo performed in all six locations in Australia and New Zealand for the Big Day Out music festival, with "In The Neighbourhood" reaching #2 on Australian radio station Triple J's charts. They won Most Promising Group at the 1995 New Zealand Music Awards., Unbeknownst to the pair, they were offered an album deal with Sony Music Australia through their producer Alan Janson. In the meantime the duo migrated to America and the album was never recorded. In 2001 the song was voted #58 in the APRA Top 100 New Zealand Songs of All Time list. The song was included on the Nature's Best 2 compilation CD released in 2002, and the music video was included on the Nature's Best DVD released in 2004. In 2002 TV2 used "In The Neighbourhood" for its station promotions. Alan Jansson remixed the song, with Makamoeafi and Iroegbu reuniting to rerecord the vocals. This sparked a renewed interest in the song causing it to be playlisted on radio. At the 2013 Silver Scroll Awards, the duo reunited to perform "In The Neighbourhood" as the closing number of the night. Brenda Makammeoafi (now Brenda Pua) lives in Australia, and Hassanah Iroegbu lives in Florida. "—" denotes a recording that did not chart or was not released in that territory. The group have appeared on many compilations over the years in New Zealand. The following is a list of these albums that have featured tracks by Sisters Underground. ^ a b c d e f Grigg, Simon. "Sisters Underground Profile". Audio Culture. Retrieved 15 October 2013. ^ a b "SISTERS UNDERGROUND - IN THE NEIGHBOURHOOD (SONG)". Charts.org.nz. Retrieved 15 October 2013. 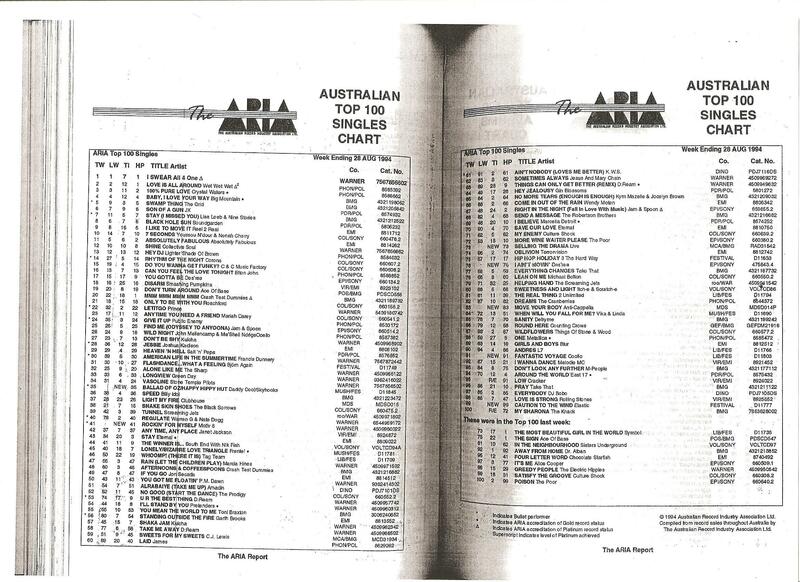 ^ a b "The ARIA Australian Top 100 Singles Chart – Week Ending 28 Aug 1994". ARIA. Retrieved 14 March 2016. ^ "1995 Winners". NZ Music Awards. Archived from the original on 16 October 2013. Retrieved 15 October 2013. ^ McLennan, Peter. "Silver Scrolls: Lorde and Little". Dub Dot Dash. Retrieved 15 October 2013. This page was last edited on 12 August 2018, at 00:26 (UTC).